[New York], December 3, 2011 - APLF Color Guide for Autumn/Winter 2012/2013 forecasts the direction of colors and materials in the coming season. The Material Trends Space at Fashion Access 2011 showcased the latest materials of exhibitors. FASHION TIME is 4 styles of your life in color and materials. 4 Fashion moments which take an optimistic approach to the trends for Autumn/Winter 2012/2013. Time to act, have fun, dream, seduce and delight in each moment, and enjoy the marvelous originality of fashion! Color is more than ever the key element in the coming season. It optimizes the evolution of our style… every moment of the day. Vivid colors, alone or teamed up with others, are the stars of the season. Neutrals and naturals evolve, taking a sophisticated, romantic and glamorous turn. And as a contrast, subtle chiaroscuro effects, in which shadows glorify the light. Materials are sublimated: luxury, quality, airiness and voluptuousness have pride of place. New, sophisticated textures, with clever effects. Finishings and trims in metal, copper, delicate gold, platinum or color brighten up matt materials. 3D effects and other innovative finishings transcend the classical looks in an exciting modern way. Time for action... Assert yourself and make the most of the present moment! Colors - Bright, energetic colors, a nostalgic multicolored range to carry the past into the future. Style & Spirit - A cheerful, nonchalant fashion, an elegant sporty spirit, subtle vintage influences. Materials & Textures - Striking, chic materials, suede, pleated leather, waxed or lacquered leather, two-tone small grains, stylized tortoiseshell prints, teddy bear colored fake fur, shaved mink or fox spirit, vintage vinyl, mottled fabrics, tweed, boiled or felted wool, reversible leather and fabrics, patchwork, masculine Jacquard, tie patterns, two-tone stripes, multicolored patterns, handmade decoration, colored rivets, eyelets. Time for confidences... A relaxed moment, tinged with melancholy, for dreaming and escaping. Colors - Neutrals and delicate bleached pastels for a gentle diaphanous harmony, inducing a peaceful, simple mood. Materials & Textures - Delicately natural materials, vegetable leather, large grains, nubuck, supple lightweight leather, nappa, knitted leather and fur, featherweight fur, transparent synthetics, pvc, pebble or mottled effects, changing looks, subtle pearly coatings, mineral motifs, marble, stoneware, Trompe-l'oeil photo prints (on knits), «Impressionist» motifs, faded floral patterns, unobtrusive covered buckles, traditional wood or printed leather clasp. Time for competition... A moment of daring, rigour and modernity. Colors - Intense, contrasting colors, a range of deep tones, sublimated with futuristic notes. Style & Spirit - A radical, futuristic style for sport and city wear, cosmic-couture and minimalist chic inspirations. Materials & Textures - High performance materials, pull-up stretch leather, smooth or crushed metallic leather, patent leather, glossy and matt mixes, two-tone effects, graphic grain, logos or pixel patterns, leather and Lycra knit mix, reflective material, coated canvas, sporty mesh, graphic, kinetic quilting, 3D coating, psychedelic patterns, geometric, checkerboard prints, stereographic prints, parallel and diagonal zips as decoration, technical buckles for city wear. A time for mysteries... A magic, glamorous moment... when dreams come true. Colors - The colors of sublimated nature and fantastic gardens, a precious range lit up with gold, platinum and strange reflections. Style & Spirit - A glamorous, poetic style for evening wear, fashion which conjures up a dream world or a modern fairytale. Materials & Textures - Luxurious & precious materials, suede calf and nappa, ostrich, reptile grains (python…), lacquered, gold leafed, precious exotic leather sheet or patchwork, smooth changing metallic leather, velvet and panne velvet, satin and satiny leather, couture pleating, poetic holograph prints, vintage embroidery and oriental motif, luxury silk scarf prints, precious stone finish, jewel trims, gold finish, large cabochons, small sequins overlapping like scales, glitter and sequins, gigantic bows and knotted straps. Source, Credits & © APLF 2011. APLF Ltd is a joint venture between SIC Group and UBM Asia. For over two decades, Hong Kong-based APLF Ltd has been providing the global leather and fashion industry with its most important meeting and trading place. APLF Ltd provides global companies a chance to trade and exchange information at a number of trade fairs. 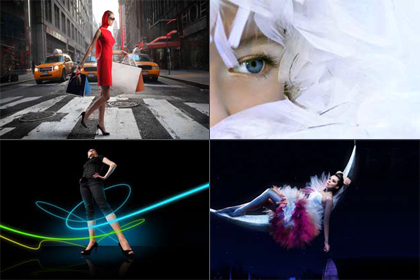 These include the major leather trade fair, APLF - Materials Manufacturing and Technology; Fashion Access, the bi-annual fairs which highlights footwear, handbags, travelware and a wide range of fashion accessories, and the annual meeting of the global apparel industry, Prime Source Forum, which are all held in Hong Kong.